Many of you have been involved in stopping the highway (I-3) through the Georgia mountains. WaysSouth is awaiting a final report and congressional decision on this project but prospects are very good this is at an end. 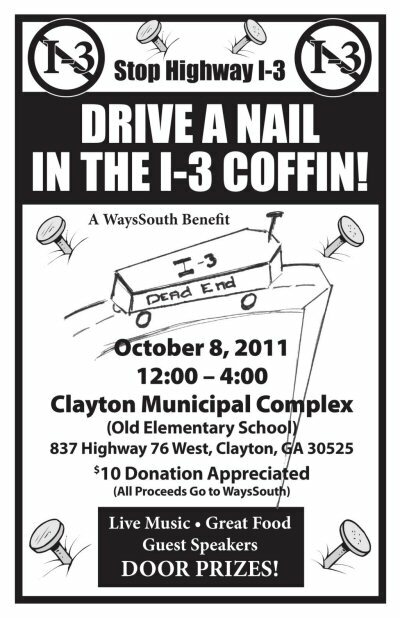 A “Drive a Nail in the I-3 Coffin” benefit will be held October 8, 2011 – beginning just after the Saturday Simply Homegrown Market closes at noon at the Clayton Municipal Complex (Old Elementary School) on Highway 76 West. Won’t you mark your calendar for this event..and take a look at the attached flyer. LIVE MUSIC – GREAT FOOD – GUEST SPEAKERS – DOOR PRIZES…..October 8, 2011 from 12:00n-4:00pm!